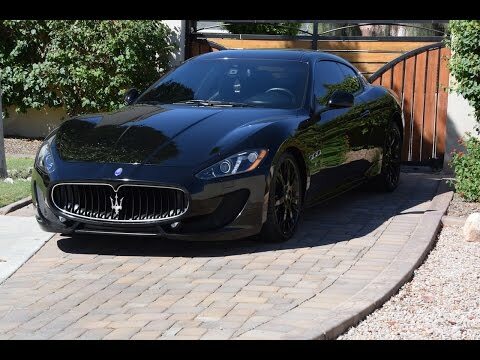 An elegantly Italian alternative to cars like the Jaguar XK and Porsche 911 Turbo, the 2014 Maserati GranTurismo is a high-fashion, high-pulse-rate, leather-lined 4-seater built for the grandest of grand touring. Whether you choose coupe or convertible, its Ferrari-inspired V8 and race-honed suspension stir passions, virtually unchanged after a mild facelift last year. The Maserati GranTurismo is for those looking for a uniquely Italian alternative to cars like the Audi R8, Jaguar XKR and Porsche 911. Driven by emotion, and a powerful V8, it's a perfect companion for the open road. One does not buy a Maserati GranTurismo because it tops J.D. Power quality charts, or because of some practical consideration. There's no spreadsheet, no objective decision tree that has "Maserati GranTurismo" at the end. If you follow your head rather than your heart, look elsewhere. Maserati is not a large company, and it has focused its efforts on the upcoming 2015 Maserati Ghibli sedan. As such, the GranTurismo is essentially the same car this year as it was last year. All 2014 Maserati GranTurismo coupes and convertibles offer 2+2 seating, essentially two pairs of buckets around a center console. The Sport models get form-fitting seats with integral headrests. The front seats power forward to help clear a path to the rear. In convertibles, the triple-insulated canvas convertible top power-deploys in just 24 seconds, at speeds up to 20 mph. Two golf bags stash in the trunk. The Maserati GranTurismo Convertible features rear rollover bars that pop up, protecting occupants in a crash. The 2014 GranTurismo's low-slung bodywork features a long, curvaceous hood, prominent oval grille and triple air vents on each front fender, a modern form-fitting take on the classic sports coupe. A facelift last year gave the coupe more aggressive air intakes in front and new headlights. The base Convertible continues with the former front-end style. All GranTurismos roll on big, 20-inch alloy wheels. The GranTurismo MC Coupe has bodywork inspired by the racing Stradale, employing a wider front spoiler and rear diffuser to make the car more stable at speed. The 2014 Maserati GranTurismo will make you feel marvelous behind the wheel, and help you look marvelous as well. The chassis balances weight almost perfectly between the front and rear, essential for good handling. The suspension is tuned two different ways. In the Sport Coupe, Convertible and Sport Convertible, you get an electronically controlled suspension system called Skyhook, which continuously adjusts damping to maintain optimum handling control and ride comfort. The racier MC Coupe and MC Convertible use a suspension with fixed-rate shocks, but lower and stiffer springs, and thicker anti-roll bars. Steering in all models feels direct and positive, and the race-bred Brembo brakes (6-piston in front) erase speed with confidence. The 454-horsepower (444 in the base Convertible model) 4-cam, 32-valve V8 provides plenty of thrust. But as sharp and responsive as it is, the GranTurismo always maintains a sense of grace, polish, and refinement. If you believe life is short and self-indulgence underrated, then you'll wind up in a Maserati dealership. The Coupe Sport starts at about $130,000 when you include destination charges and gas-guzzler taxes. The MC coupe is nearly $150,000. Top-down GranTurismos start at about $142,000 for base Convertible, while the Sport starts off at about $146,000, and the GranTurismo Convertible MC starts at about $145,000. However, it's simple to push the price even deeper into six digits. If you want matte-finish paint, you'll add $20,500, for example. The GranTurismo's character and passion compensate for its lack of modern tech compared to the Audi R8, BMW 650, Mercedes-Benz CL550 and Jaguar XKR. Resale value should hold up reasonably well. Obviously, servicing dealers are fewer and farther between than with other premium brands. Be sure to check the KBB.com Fair Purchase Price before committing to a deal on a 2014 Maserati GranTurismo. Present and accounted for are features you'd expect in a $130,000 sports-luxury car, such as navigation (7-inch screen), extensive leather trim, heated power front seats with memory, a Bose surround-sound audio system with satellite radio and Bluetooth/iPod integration, a hard drive to store music, rear parking sensors, and rain-sensing wipers. On the convertible GranTurismos, the A/C settings adjust automatically based on whether the top is up or down. Maserati offers a staggering degree of personalization for the GranTurismo. The convertible top comes in six colors. The interior can be trimmed in black chrome or exotic woods like padouk and wenge. There are eight different finishes for the brake calipers and four different wheel designs, each available in bright silver or dark charcoal. The MC Coupe is available with exterior carbon-fiber accents. Convertibles can be optioned with a wind-stop screen behind the front seats to reduce turbulence. Conspicuous by their absence in this exotic sports coupe are high-tech options like night vision, a head-up instrument display, or dynamic cruise control. While it seems superfluous to add a "Sport" button to something like the 2014 Maserati GranTurismo, one push and the exhaust sings more intensely, shifts quicken, and the Skyhook adjustable-damping suspension delivers a firmer ride and sharper handling. We love the long, racing-style shift paddles for the 2014 GranTurismo's 6-speed automatic transmission. They embody the same artistic flair and bold design as the rest of the car, with light-alloy construction and a tactile shift control enhancing the driving experience. The heart of this Maserati is its melodic, high-spirited 4.7-liter V8 engine. Co-developed with Ferrari, it makes 454 horsepower in GranTurismo coupes and in the Convertible Sport. The base GranTurismo Convertible now uses the 444-horsepower version of this engine. Fuel economy isn't great, but it's smooth, responsive and strong. In Sport mode, it is especially intoxicating when the exhaust system bypass-valve opens above 3,000 rpm. The GranTurismo's 6-speed automatic transmission also offers a Sport mode for quicker shifts, a Manual setting for full manual gear selection via steering column-mounted paddle shifters, and an Ice mode for low-grip situations where the transmission starts out in 2nd gear. The 2014 Maserati GranTurismo is a unique take on the Italian exotic-car formula. With a name that's automotive couture, a leather-lined interior, and a shape that could only come from Italy, the Maserati GranTurismo brings the visual appeal. Add a Ferrari-inspired V8 engine and quick-shifting transmission, plus programmable suspension and transmission modes, and you have a car that can back up its curbside appeal. Less expensive than an Aston Martin DB9 or Bentley Continental, but a bit more than a Jaguar XKR or Porsche 911, it has a personality quite different from any of them. This year is mostly the same as last, with two coupe models (Sport and MC), and three Convertibles (base, Sport and MC) to choose from.